It appears the rumours that have been circulating got it right as Apple has unveiled a plethora of new products as predicted by some experts. Sticking to tradition, the media invitation hinted at what Apple was to unveil, which included a new iPad Air, iPad mini with Retina display, MacBook Pro and of course, the new iPad Smart Covers. What's even more exciting for Mac owners is the news that the new operating system, OS X Mavericks, will be available as a free update; starting today! Before I continue, here's a brief summary of the main news from the event. OS X Mavericks will be free for all - anyone with a 2007 or later device can download the OS from the App Store. iPad Air - brand new iPad houses the M7 and A7 chip. 20% lighter than the previous model with prices starting from $499. The iPad will hit stores on November 1st. iPad mini with Retina display - The new iPad mini costs $399 and will also launch November 1st. Current iPad mini will drop to $299. MacBook Pro - Houses the new Haswell chip and costs $1299 for the 13" model - $1999 for the 15" model - both go on sale today. Mac Pro - Costs $2999 - currently no shipping date. iLife and iWork - Updates coming to both and will be available today. To start off the event, Craig Federigi walked through some of the improvements that OS X Maverick would bring to Mac devices. This included an hour longer web browsing on a MacBook Air, and an hour and a half longer watching video. Other features included bringing iBook and Maps from iOS to OS x, fully functional multi-display support and iCloud keychain that allows you to save passwords on iOS devices and use them on your Mac. Best of all, OS X Maverick is free to all users who have an Mac device that was purchased in 2007 or later. 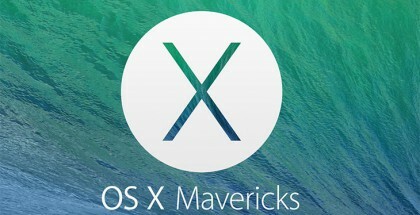 You can download OS X Mavericks for free, here. Next, Tim Cook introduced the new iPad Air. This tablet is the "lightest full size tablet in the world," weighing in at only 1lb (under 500g). Apple has achieved this by making the tablet 20 per cent thinner and reducing the bezel by 43 percent. 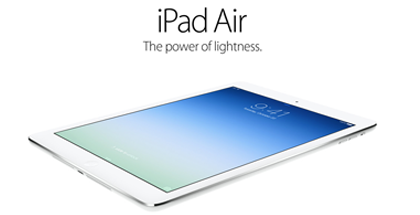 The iPad Air also houses a 9.7-inch retina display, A7 and M7 chip, and a battery that provides 10 hours battery life. 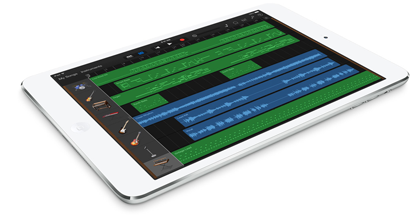 Like the iPhone 5s, the iPad Air used a 64-bit architecture with more than 1 billion transistors. This makes the device eight times faster than the original iPad, and has 72 times more graphical power. The iPad Air features a 5-mega-pixel that can record in 1080p, a front-facing FaceTime camera, dual microphones and Siri. It will be available on November 1st and comes in 'Space Gray' and 'Silver'. The 16GB version will cost $499.00 and the cellular model will cost $629.00. 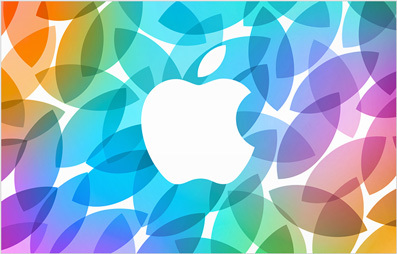 It will replace the current iPad 4, whilst the iPad 2 will continue to be on sale. Just like the iPad Air, the iPad mini with Retina display also had a vast upgrade compared to its predecessor; the iPad mini. Obviously, the focus of this new iPad is the Retina display as stated by Phil Schiller: "The one most-requested feature to add to iPad mini is a beautiful Retina display." The Retina display on the new iPad has the same resolution as the iPad Air - 2048-by-1536 pixels - but a smaller screen as just 7.9-inches. Therefore, this allows the tablets to run the same software. To compare the two devices, the iPad mini with Retina display has a higher pixel density with 326 ppi (pixels per inch,) whilst the iPad Air has just 264 ppi. Not to be out-beaten, the iPad mini with retina display also houses the same 64-bit A7 and M7 chips that both the iPad Air and iPhone 5s do. This means the iPad mini with Retina display will have four times the CPU performance end eight times the GPU power that the iPad mini has. What's more, no sacrifice has been made when it comes to the battery life, as the new iPad mini retains the 10-hour battery life. Like the iPad Air, the iPad mini with Retina display will comes in 'Space Gray' and 'Silver'. The 16GB version will cost $399.00 and the cellular model will cost $529.00. However, the device won't be available until 'late November'.